Earthenware inkwell with white glaze. Hinged lid, hollow body, round opening at center top encased in brass collar. 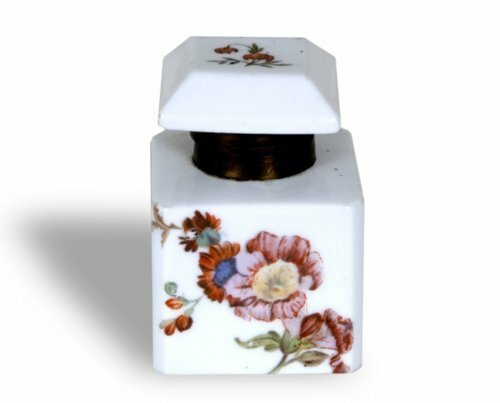 Transfer-printed flowers decorate top of lid and front of inkwell. This inkwell was given to W.F. Horn in 1896. Horn was known for forging historical records. He claimed this was one of several inkwells used at Shawnee Mission during a meeting of the 1855 Territorial Legislature where the so-called "bogus legislature" wrote laws intended to make Kansas a slave state. He also claimed that this inkwell was later used by Charles Robinson who served one term as Kansas governor in the early 1860s.